WHAT is probably the first French all-metal commercial aeroplane has recently been finished at the works of the Societe pour la Construction d'Avians Metalliques "Avimeta" ДальшеMore>>> of Courbevoie-sur-Seine. This firm, it may be recollected, exhibited at the last Paris Aero Show a monoplane fighter of somewhat unorthodox design and construction, but of all-metal construction, even to the wing covering. The new machine, although of very different design, is similar to the exhibition monoplane nor only in being a monoplane but also in having its wing covering of metal. The metal used almost exclusively in the construction is that known as "Alferium," an aluminium alloy manufactured by the Schneider firm. The "Avimeta" A.V.M. 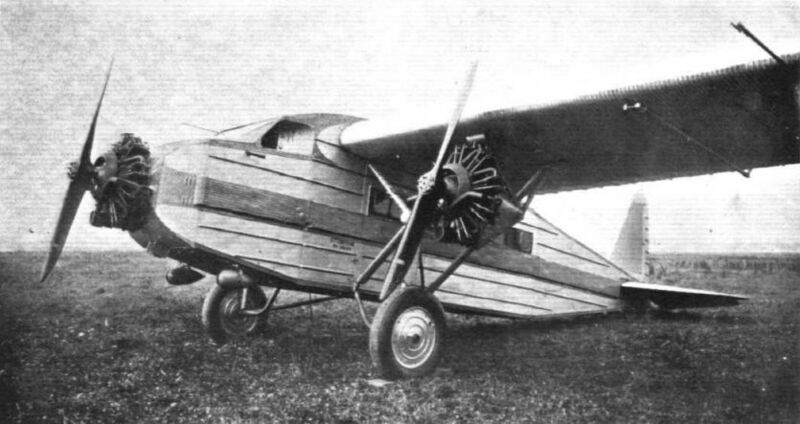 132 is a three-engined monoplane of the same general type as the Fokker F.VII 3-m, but differing from that machine both constructionally and in several features of its design. The monoplane wing, the two halves of which are attached to the fuselage by two quick-release devices each, is of trapezoidal plan form, with rounded wing tips. Details of the wing section used are not available, but from the fact that the wing is practically a cantilever, the section must be a fairly thick one. There are two main spars, and a certain number of fore and aft members to which is rivetted the corrugated wing covering which is bent to form the wing section. On each side a pair of struts run from the lower longerons to the wing spars, being attached to the latter at the points of support of the outboard engines. Other struts run to the top longerons of the fuselage. The undercarriage struts (telescopic) are taken to the junction of these wing struts with one another, while the rear chassis struts, acting as radius rods, are hinged to the lower longerons of the fuselage, as are also the sharply bent wheel axles. The ailerons, which are of narrow chord, run the entire span of the wing, and are operated from cranks on the front spar via an external tube under the wing, visible in some of the photographs. The fuselage is of rectangular section, and has four main longerons in the form of tubes carrying formers to which the sheet metal covering is rivetted. The fuselage is in three sections for ease of transport. The front portion extends from the nose to a point just aft of the cabin. The rear portion is the tail unit, and the middle portion extends from aft of the cabin to the tail. The front portion of the fuselage is of slightly different construction, being so designed that bulkheads, bracing, etc., interfere as little as possible with the free space of the cabin. The latter is of large proportions, measuring 3-9 m. (12 ft. 9 in.) in length, 1-6 m. (5 ft. 3 in.) in width, and 1-8 m. (5 ft. 11 in.) in height. This space can either be used as one cabin arranged as a Pullman, or can be divided into two separate compartments with beds. The machine will, we understand, be produced in two types, one for ordinary day flying and one for night flying The total loaded weights of the two types will differ somewhat. Details of these will be given at the end of these notes. An unusual feature of the tail of the A.V.M.132 is that the vertical surfaces, fin and rudder, are of the same size as, and interchangeable with, one-half of the horizontal surfaces. That is to say the fin is identical with one half of the tail plane, and the rudder identical with one elevator flap. While having the advantage of reducing the number of spares, and possibly the cost of production slightly, this arrangement would appear open to criticism on the score that the resultant vertical tail areas are somewhat small. The rudder particularly appears to English eyes inadequate to deal with turning moments set up by the stoppage of one of the outboard engines. The fin is adjustable, but only on the ground, so that no assistance is to be expected from it in such a contingency. The tail plane, on the other hand, is provided with a trimming gear. The power plant of the A.V.M.132 consists of three Salmson radial air-cooled engines of the 9 AB type, developing a nominal power of 230 h.p. each. The petrol tanks are situated in the wing, with direct gravity feed. They are provided with jettison valves so that in an emergency the tanks can be emptied while the machine is flying. The cockpit for the crew is ahead of the cabin and provided with a wind screen merging into the roof of the cabin. Dual controls are provided, and the machine is equipped with both transmitting and receiving wireless apparatus. Following are the main characteristics of the "Avimeta" A.V.M.132. :- Wing span, 21-9 m. (71 ft. 10 in. ); length overall, 14-3 m. (46 ft. 11 in. ); wing area, 71 m2. (764 sq. ft.); tare weight, 2,700 kg. (5.940 lbs. ); weight of crew, 160 kg. (352 lbs. ); weight of fuel, 820 kg. (1,800 lbs. ); paying load, 1,200 kg. (2,640 lbs. ); total loaded weight, 4,880 kg. (10,732 lbs. ); wing loading, 68-5 kg./m2 (14 lbs./sq. ft.); power loading (on 690 h.p. ), 6-8 kg./h.p. (15-5 lbs./h.p. ); maximum speed, 182 km./h. (113 m.p.h. ); cruising speed, 170 km./h. (105 m.p.h. ); climb to 2,000 m. (6-600 ft.) in 19 mins. ; theoretical ceiling, 3,750 m. (12,300 ft.); range at cruising speed, 900 km. (560 miles). These figures ah relate to the machine as equipped for day flying. The night-flying machine has a slightly higher tare weight (6,200 lbs. ), carries less fuel (1,100 lbs) and a smaller paying load (1,800 lbs.). This results in a reduced range (370 miles), a better climb, and a higher ceiling. Although the "Avimeta" A.V.M. 132 incorporates certain features which can be criticised, the machine looks a promising type, and it will be interesting to see how it behaves on actual service once the preliminary tests, which are now proceeding, have been completed. The ratio of tare weight to total loaded weight is very good, possibly owing to the use of the "Alferium" alloy. The factor of safety is given as 7-5 for the day machine and 8 for the night flyer. 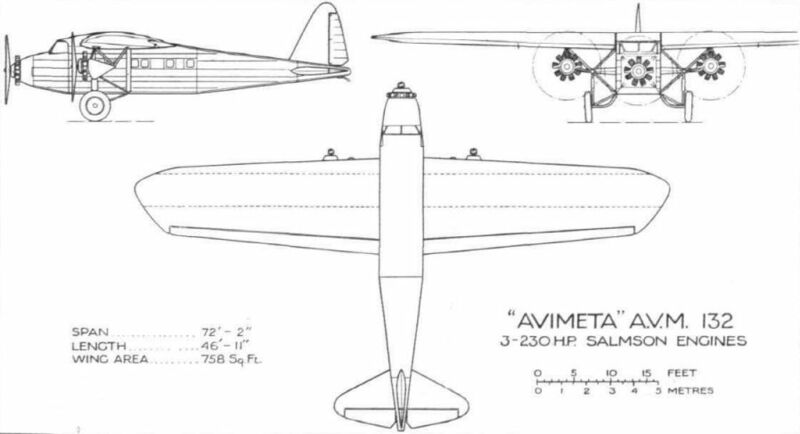 THE "AVIMETA" A.V.M.132: View of Fuselage, engines, undercarriage, etc. THE "AVIMETA" A.V.M.132: Side View. THE "AVIMETA" A.V.M.132: Front View. The engines are Salmsons, of 230 h.p. each.